Correlation is defined in statistics as the relationship between two or more variables. The relationship is established by observing the values of the variables. When used in finance, correlation is typically used to measure how the prices of two assets move in relation to each other. In the calculation of Portfolio Optimization, correlation is used to find stocks which have a low or negative correlation with each other for diversification purposes. Other than asset prices, some analysts use correlation to find the relationship between asset prices and the various fundamental indicators. An example is the relationship between the S&P 500 earnings with the U.S. Gross Domestic Product (GDP). To calculate the correlation basically requires the values of two or more variables. If we have two set of values x and y, the following formula can be used. where x is each of the values of x and y is each of the values in y. In Microsoft Excel, the Correl(x,y) function can be used to calculate the correlation quickly and easily. This spreadsheet downloads stock price data from https://finance.yahoo.com and calculates the correlation between the different stocks specified automatically. It is useful for finding correlations between different assets to use in the construction of an optimum portfolio. The free version supports up to 2 stocks while the professional version supports up to 7 stocks. When the correlations of more than two assets are required, a correlation matrix is used. Start Date (MM/DD/YYYY) - Start date to download the stock price. End Date (MM/DD/YYYY) - End date to download the stock price. Stock Quotes Frequency - Download the Monthly, Weekly or Daily stock prices. Stock Symbols - The stock symbol of the stock to download the stock price. For other types of download frequency, the average returns will be calculated in a similar manner. Standard Deviation - The standard deviation of the returns is calculated in this field. 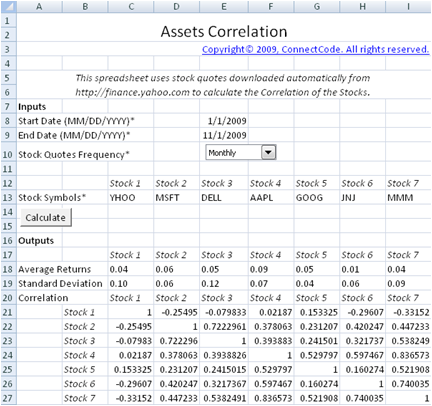 Correlation - The correlation of the returns are calculated in this field. If two stocks have a tendency to move in the same direction, it will be shown as a positive number. If two stocks do not have a tendency to move in the same direction, it will be shown as a negative number or a very small positive number.